Daymond Garfield John is an American businessman, author, motivational speaker and investor from Brooklyn. John is best known to be the founder, CEO, and president of FUBU. He also appears as one of the investors on the ABC reality show ‘Shark Tank’. John is the founder of The Shark Group which was based in New York City. As of 2019, Damond John’s net worth is estimated to be roughly $300 million dollars. Daymond Garfield John was born in Brooklyn, New York on the 23rd of February, 1969. John grew up in the Queen’s neighborhood of Hollis. In high school, John was often in a program that allowed him to work a full-time job and attend school on an alternating weekly basis. John never attended college, so that he could begin his career and supporting his family as soon as possible. His career started when he became the CEO and president of the company FUBU. Daymond John’s career started when he set up the FUBU business. He began working at Red Lobster to generate funds, he also started to work with his friends, J.Alexander Martin, and Keith Perrin to sew the FUBU logo on hockey jerseys. John is one of the main investors on ‘Shark Tank’, a television show where business executives listen to business pitches and decide which venture to invest their money in. Barbara Corcoran, Lori Greiner, Mark Cuban, and Robert Herjavec, are also sharks on the show. He became associated with brands; Pitbull and Miss Universe organization as a public speaker. John addresses gatherings on negotiations, marketing, and entrepreneurship. John has to his credit, speaking engagements; California First Lady Maria Shriver’s Women’s Conference, AT&T’s History Makers Tour and the Creative Liaisons Program at the annual London International Awards. Daymond has won multiple awards throughout his career. He was awarded the Brandweek Marketer of the Year, and also the NAACP Entrepreneurs of the Year twice. John has starred in the television series; ‘The Game’ and ‘The Real’ as of 2013, and has acted in the films ‘The Crow: Wicked Prayer’ and ‘Sharknado 2’. As of 2019, Daymond John’s net worth is estimated to be $300 million dollars. View our larger collection of the best Daymond John quotes! Daymond John has appeared on several films and tv-shows throughout his career. John is a talented investor that also has starred in the reality investor program ‘Shark Tank’ where he invested in a lot of companies. There’s no doubt that John’s net worth will continue to increase, his net worth is incredible and one of the biggest reason because of that is his business FUBU. As of 2019, Daymond John’s net worth is estimated to be roughly $300 million dollars. 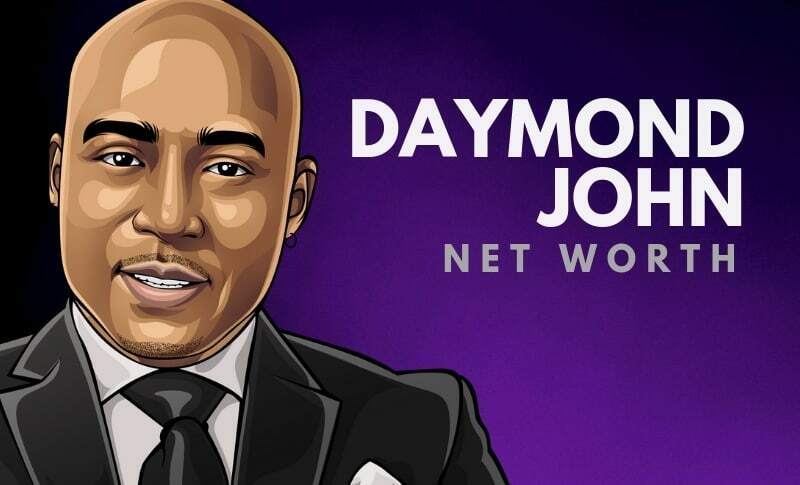 What do you think about Daymond John’s net worth? Leave a comment below.